A growing chorus of amateur and enthusiast photographers have been wondering aloud if a full-frame sensor would ever find its way into a more compact, intuitive, and consumer-oriented camera body – and equally important, a price range that won’t induce heartburn. Nikon and Canon both seem to have their fingers on the pulse of consumer preferences. On Sept. 13, Nikon announced the arrival of the D600, a consumer-targeted DSLR that includes a 24.3-megapixel full-frame CMOS sensor. And on Sept. 17, Canon rebuffed Nikon’s D600 announcement with an equally impressive consumer-minded full-frame DSLR, the EOS 6D. Further examining the D600, its sensor is embedded into a camera body that most resembles – in design and weight – the company’s more veteran high-end consumer DSLR, the D7000. However, its dimensions and its image production are more closely aligned to Nikon’s 36-megapixel full-frame sensor DSLR, the D800. For starters, perspective D600 users will enjoy the full-frame sensor’s 35mm film-like appeal. The camera allows amateur photographers to break free from the cropping-factor that is typical of smaller sensors found in consumer DSLRs like the D7000, hybrid cameras, and DSCs. And the price tag? The D600 costs just shy of $2,100 – enough to still give some photographers stomach churning anxiety – and places it in price range and direct competition with Sony’s $2,000 full-frame high-end DSLR, the a850, and is just a few pennies more than Canon’s new EOD 6D. Still, the D600 is priced well below the most affordable Nikon or Canon full-frame sensor DSLRs, including the roughly $3,000 Nikon D800, or the $3,450 Canon 5D Mark III. Nikon justifies the D600 retail price for its obvious 24.3-mpx full-frame sensor, but also because the camera can photograph at a snappy and nimble 5.5-frames-per-second, and it includes a 39-point autofocus system, has a D800 sized 3.2-inch 921k-dot LCD screen, and is capable of filming 1080p30 full HD video with accompanying stereo sound recording. ISO range of 100-6400, but expandable to 50-25600 equivalents. In-camera image and video editing. MOV video file format, plus H.264/MPEG-4 compression formats. Audio headphone jack to compliment and monitor video recording. The D600 likely will appeal to two very different types of photographers. Enthusiast photographers will be drawn to its intuitive functionality, creative features and filters, and its full-frame sensor. Professional photographers will be attracted to the latter, and could consider the D600 as a lightweight and affordable compliment to their broader and heavier pool of camera gear. This blurring of camera genres situates the D600 in a unique place among the broader Nikon family. The D600 could potentially replace the 12.3-mpx “DX” sensor format of the Nikon D300S – the latter has been billed as the company’s top “DX” camera and the entry-level pro-DSLR model. Yet, the D600’s full-format “FX” CMOS sensor easily trumps the D300S, and is more closely related to the semi-pro Nikon D700 and its 12.1-mpx “FX” sensor. Even still, the megapixel count of the D600 is more than double that of the D700. This leaves many to wonder, even us at DxOMark, if this consumer-marketed DSLR will eclipse the image quality of the D300S and D700, and potentially approach the image quality of the 36-mpx D800. The D600’s full-frame 24.3-megapixel CMOS sensor did not disappoint. It received a DxOMark Overall Score of 94, placing it in the number three position on DxOMark’s camera sensor database. Coincidently, the D600 was ranked just below two of its relatives, including the D800 and D800E. Similar to the D800 and D800E, the D600 delivered a golden all-around performance. Portrait, nature, and wildlife photographers will find this camera magnetic for its color reproduction. At 25.1 bits, the D600’s sensor captures an abundance of colors with varying levels of saturation and intensity. Landscape and architecture photographers will appreciate the camera’s high-caliber and broad dynamic range – it finds details in some of the most contrast heavy scenes, including in images that have a mix of dark shadows and bright highlights. And sports and entertainment photographer will be more than content with the D600’s low light shooting. It has a knack for pushing the limits of image quality in dim environments. The camera delivers well-balanced photos until around 3000 ISO, after which its quality begins to taper off. 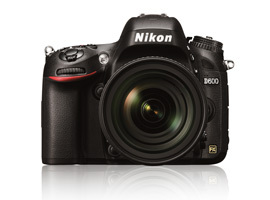 On paper, the D600 would seem to have more in common with Nikon’s flagship professional DSLRs, the D3X. For starters, they both support full-frame sensors that roughly contain about 24.5-megapixels. But that’s where most of their similarities end, at least with their sensor similarities. The D600’s sensor bested its more austere sibling by six points and performed better than the D3X in every sensor quality category. Color reproduction was much stronger in the D600 than the D3X, with Nikon’s consumer full-frame DSLR registering 25.1 bits compared to the professional-oriented flagship camera’s 24.7 bits. This four-tenths of a bit separation between the two translates to the D600 having 1/3-stop better color depth than the D3X. Interestingly, this gap in color depth becomes slightly more pronounced at higher ISOs. The D600’s command of dynamic range was also notably better than the D3X, 14.2 Evs to 13.7 Evs respectively. The D600’s dynamic range registered 1/2-stop better than its nearly four-year-old relative. The sensor quality gulf widened between the D600 and D3X when analyzing their low light performances. The D600’s low light capabilities are about 2/3-stop better than the sports-oriented D3X, with the latter’s image quality falling off around 2000 ISO, and the D600’s image quality deteriorating at the relatively high threshold of 3000 ISO. So how does the D600 stack up against Nikon’s other high-end full-frame DSLRs that were released this year? Including the semi-professional 36-megapixel Nikon D800, and the pro-marketed 16-megapixel sensor of the D4? The D600 trailed the D800’s DxOMark score of 95 by an insignificant one-point. But it bested the D4 by a more impressive five points. The D800 was the king of color depth between the trio, notching 25.3 bits of color compared to the 25.1 bits of the D600, and the 24.7 bits of the D4. However, the gap between the D600 and the D800 is pretty minimal. Dynamic range quality of the D600 closely mirrored that of the D800 – 0.2 Evs separated the two. But there was a dramatic dynamic range quality difference between the D600’s score of 14.2 Evs and the D4’s score of 13.1 Evs. This equates to a full 1-stop difference between the D600 and the D4 for low ISO settings. The Nikon D600 scored a low light ISO score (2980 ISO) during DxOMark testing. Although the gap between the three cameras (D800’s score of 2853 ISO and the D4’s 2965 ISO) was insignificant, and photographers cannot visually distinguish the low light differences between these Nikon models. These 3 scores are in the top 5 on the DXOMark lowlight ISO ranking. DxOMark has yet to get its hands on the D600’s direct rival, Canon’s EOS 6D – this comparison would be most compelling. However, it is worth contrasting Nikon’s newest full-frame DSLR to the new and high quality 22-megapixel full-frame sensor of the Canon 5D Mark III, and the more veteran and wildly popular 21.1-megapixel 5D Mark II. A quick comparison snapshot illustrates that the D600 continues the Nikon sensor quality dominance over Canon’s most treasured models. Hopefully the EOS 6D will make Canon and Nikon’s sensor and image quality feud more competitive. The D600 dominated the color depth quality of both the 5D Mark III and the Mark II. The Nikon model had a 2/3-stop advantage in color quality over the Mark III, and a 1-stop edge over the Mark II. This full-stop improvement over the older Canon model means the D600 is capable of capturing twice the number of colors as the Mark II if we take into account the colored noise. Dynamic range quality was not much of a contest between the D600 and the 5D Mark III or the Mark II. The D600’s image dynamic was nearly 2.5-stops better than its Canon rivals. Although it is worth noting that the 5D Mark III equalizes the dynamic range performance of the D600 at around 3200 ISO, and it actually performs better than the D600 at around 8000 ISO. Canon has long been praised for its ability to perform photo miracles in the dark, and the Mark III and Mark II are no exceptions. However, Nikon has made great strides at improving its low light image quality, which shows in the D600’s low light performance. It bests the Mark III by nearly 1/3-stop and trounces the Mark II by nearly 2/3-stop. Nikon’s D600 will certainly help camera enthusiasts and avid photography hobbyists reach for what they once thought was unobtainable – an intuitive and more affordable high quality full-frame DSLR. As an added bonus, the camera provides users extreme value, as noted through its DxOMark sensor score of 94, which puts it in an elite category currently occupied by two additional Nikon cameras. However, it will be interesting to note if Canon and its recently launched EOS 6D – a full-frame, lightweight, and affordable DSLR that directly competes with the D600 – can close the sensor and image quality gap between the two friendly rivals. DxOMark will be sure to answer this question once we obtain Canon’s new EOS 6D.